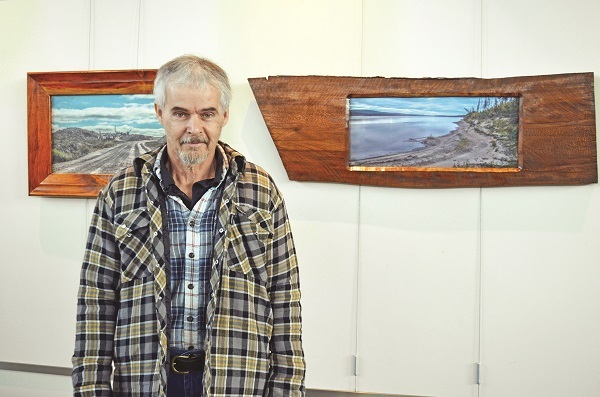 The old adage about the road less travelled is not just a saying that has become threadbare over the course of time; it provides a bounty of inspiration – artistic and otherwise – for Aurora artist Rick Armstrong. Never one to shy away from an adventure, especially if he has a camera in hand, Mr. Armstrong recently set out for Labrador for a unique journey: spending 21 days in his truck, travelling Newfoundland & Labrador’s Highway 510, an unpaved route connecting Red Bay to Happy Valley Goose Bay, charting his journey one snap at a time. The results of his trip through a swath of the Province’s oft-forgotten mainland is now on display at the Aurora Public Library’s Colleen Abbott Gallery in an exhibition entitled Highway 510 Labrador: 21 Days in my Truck. By the time Mr. Armstrong arrived in Labrador, Highway 510 had only been open to traffic for four years. It was, quite literally, the road less travelled and, with that, came some romantic ideas. Also inspiring some of his shots were historic and contemporary images of train travel between Canada’s coasts. Most of these images, he says, focus on stations or locales not far removed. Little time is spent focusing on the stretches of scenery – natural and built – in between. In the case of Highway 510, there is majestic scenery. There was untamed wilderness, landscapes tamed only by mining, both ongoing efforts and abandoned quarries. There were mountains, lakes, sunsets, plateau, a cross-section of Canada stretching to the horizon and well beyond. Mr. Armstrong’s love of photography began with his mother who enrolled in a famous photographers’ course when her son was very young. She is responsible for placing the first camera in his hands and encouraging him to stretch his creative muscles. His epic journeys into the Canadian landscape have planted the seeds of thinking big as far as his photography goes, rather than just getting up in the morning and capturing simpler scenes in life, like the early morning sunrise, but his passion is ever-present and strong as ever. “I would like people who come and see my photographs to give Canada a thought before they head off to some sunny destination somewhere in a jet and think about seeing the country they live in before they do that, and get out and explore it,” he says. Highway 510 Labrador: 21 Days in My Truck runs at the Colleen Abbott Gallery through February 10.